The start of festival season is an exciting time, as people from all walks of life come together to celebrate together. Whether you’re after music, dance, or just all-out celebration, there are a plethora of Barcelona festivals that are sure to be just up your street this year. Originating in Rio, Carnival in Barcelona is growing in popularity each year and is considered to be the last change to go wild before Lent in this mainly Catholic country. The main party is La Gran Rua de Carneval, where you’ll see fancy dress, fireworks and floats forming a grand parade down the main streets of the city, but many revellers will tell you that the real action is actually in Sitges, a nearby coastal resort famous for its gay nightlife. You’ll find half of Barcelona’s student population heading there on the train in fabulous fancy dress! The F1 arrives at the Circuit de Catalunya in Montmelo, just 12 miles from Barcelona, each May for the Spanish Grand Prix. The race is one of the oldest in the world and celebrated its centenary in 2013, and the three day event of roaring engines and flags is a highlight of Spring for many. Book your tickets well in advance and make sure you pack your suncream! Perched on the sun-drenched eastern Spanish coast between Valencia and Barcelona, Benicassim (Festival Internacional de Benicàssim), represents a festival mecca for alternative music fans looking to enjoy an alluring line-up of the world's leading music stars both old and new. An envious 2019 bill sees performances from indie superstars Kings of Leon, sultry songstress Lana Del Rey and Stockport’s finest, Blossoms. Garnering an impressive reputation over the last few years as one of the world’s leading experimental electronic music festivals. Tickets can be pricey, but it’s worth it as during the week of the festival, Barcelona transforms into one big party, with unofficial mash-up’s, and spontaneous events in bars, clubs and beaches happening around the city. 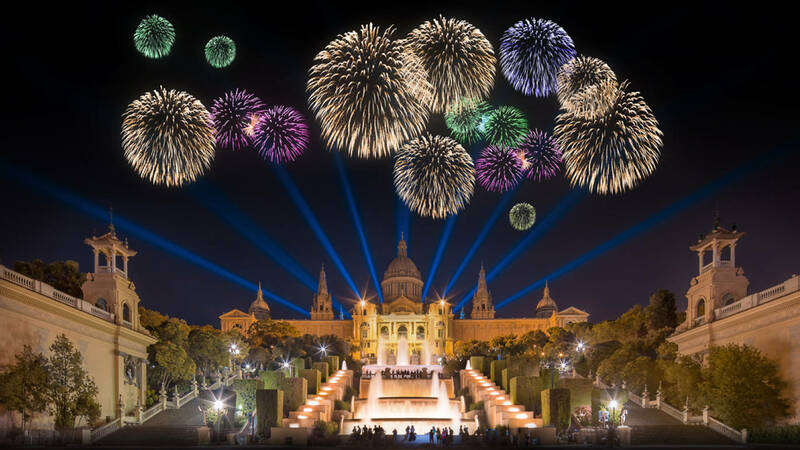 The eve of Sant Joan is undoubtedly the biggest party night of the year in Spain’s fiesta-filled diary. This midsummer celebration offers fireworks and all-night celebrations (luckily the 24th is a public holiday, leaving revellers with the opportunity to indulge in plenty of cerveza and party until the sun comes up. Head to the beach to make the most of this fantastic night in the Spanish calendar. For something a little more mellow, head up the grassy hills of the Montjuic fortress for a night of openair cinema, picnics and jazz. Films are screened every Monday, Wednesday and Friday at 22.00, but it’s best to get there earlier to grab the best spot, enjoy the music before the film starts, and check out the wonderful food stalls on offer. Although this fruity festival isn't in Barcelona, if you're in the city on the last Wednesday of August, you won't want to miss this. Join locals and visitors alike on the early-morning bus from BCN to Bunol in order to arrive for the start of this giant tomato fight at 11am. It's an unforgettable experience - just don't wear your best clothes!